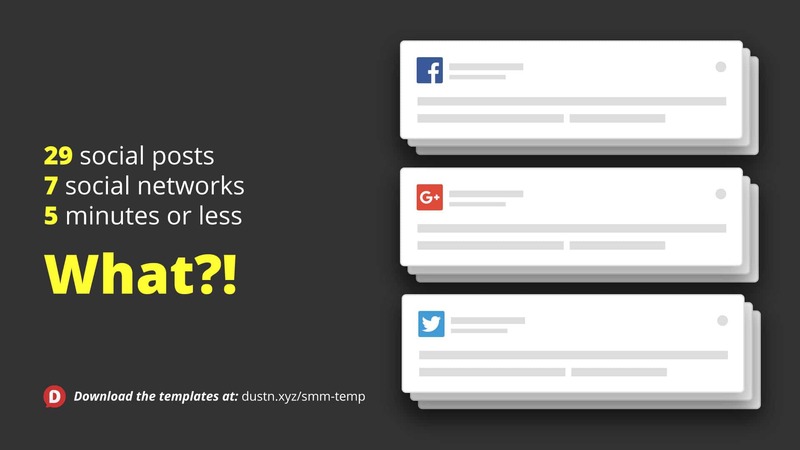 A quick and simple template for creating 30 days worth of social media posts in 5 minutes or less! Let’s say you’ve just finished up a blog post and it’s a masterpiece. You’ve spent hours crafting it, ensuring that it’s a literary work of brilliance. You’ve carefully crafted your content in a way that people are just going to eat it up and ask for seconds. Finally, you get to hit that beautiful “Publish” button. Feels good. But now what? Oh, that’s right–now you have to get that wonderful piece of blog post goodness out in front of people. How do you do that? Well, social media, of course. Let’s face it, promoting your blog posts across all your social networks isn’t the most fun part of blogging. In fact, it can become pretty tedious and boring work if you’ve been doing it for a while. But what if I told you it didn’t have to be that way? 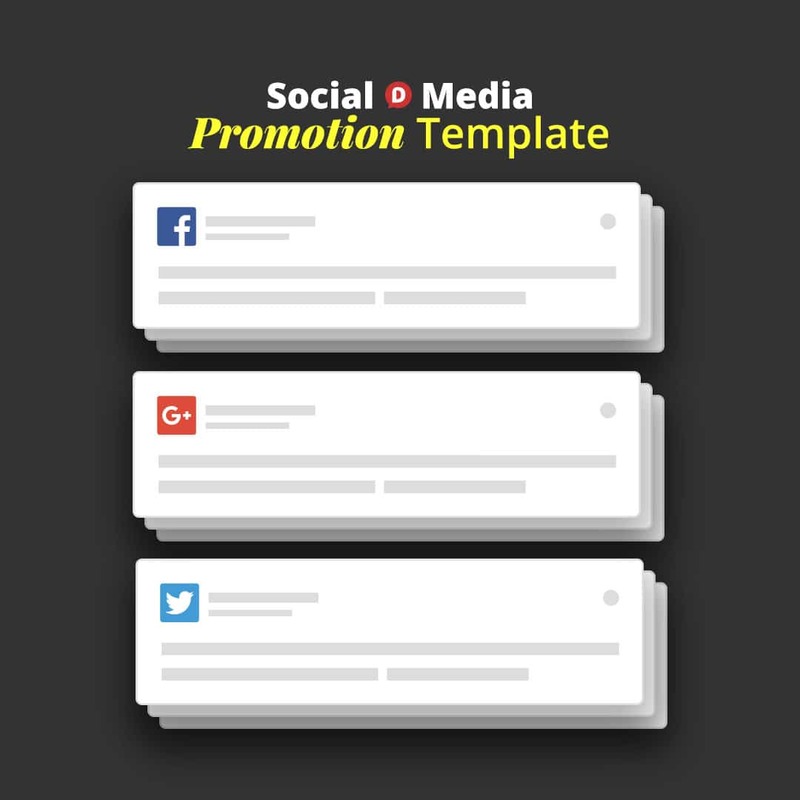 What if I told you that you could implement a simple social media promotion template that would cut down your time into a mere fraction of what it would normally take you? You’d probably think I was selling something, wouldn’t you? Well I’m not here to sell you anything. I’m here to show you exactly how I have mastered the process of promoting my blog posts on social media with maximum effectiveness and minimum effort. When I publish a blog post, I spend roughly 5 minutes scheduling out 30 days worth of social media shares across 7 different social networks. And just to be clear, I’m not just sharing out the headline of my article and a link to it. I’m scheduling out 29 different messages over the course of 30 days to 9 social profiles. Simple. I’ve created a template, and I use the heck out of it. Want the PDF version of this post? Jump straight to the download below! Title: This is pretty obvious–just the title of the article. Always keep this 70 characters or less. Lead: The lead is what I call the brief introduction that I put at the very beginning of every blog post. It serves as a sort of “hook” or a “why you should read this” intro to the post. Its purpose is to make it very clear, in 1-2 sentences why the reader needs to read the article. Keep this to 110 characters or less and make sure you’ve mentioned your primary keyword once. Summary: This is a longer 2-3 sentence summation of the post. What are they going to get from it without giving it away entirely? You will want to make sure you have all your keywords hit in this element. No character limit, but it shouldn’t be too long. Quote: Use the best quote from the article or turn one of your best points in the article into a quote. Keep it to 110 characters or less. If your quote is from an influencer, be sure to use their Twitter handle in the quote. Question: Your article should be the answer to some question or problem that your audience is facing. Formulate that question and use it here, in 110 characters or less. Tweet: A message that will be exclusively for Twitter–optimize it for the Twitter audience to get the most clicks (add hashtags inline with the text). Again, 110 characters or less. CTA: This is simply the link to your article. Hashtags: You should have at least one good hashtag that goes along with your article. You only need 2 maximum. [Lead] = As the recent fate of Vine shows us, you should never put your audience solely in someone else’s hands. [Summary] = Are you working to build an audience online? If so, I want to warn you about a very serious social media mistake that I see a lot of social media stars making. [Question] = Are you in danger of making the BIGGEST Social Media mistake? [Tweet] = Don’t make the BIGGEST #SocialMedia mistake like so many others. Once I’ve filled these out, I can start copying and then pasting them into my scheduled social messages. Next, I’ll show you how I break it down for each network. Download the free Template for exactly what I show you in this article as well as a PDF version of this post to save for your convenience. Using varying combinations of those text helpers, I’ll schedule out 3 Google+ posts over the course of the next 4 weeks. Post 1: Link post format. Post 2: Image post format (so an uploaded image goes with this). Post 3: Image post format. By combining different pieces of the text helpers you can create 3 completely different messages. You can create even more combinations if you like, this is just what I do. Since Facebook has a similar posting volume as Google+ for me, I use 3 posts as well, but with a different combination of helpers. Post 2: Image post format. If you’re familiar with how Twitter works, you’ll know it has a much higher posting volume tolerance, so I schedule out at least 5 different tweets for the 4-week span. All of these tweets, except for the first one, has an image uploaded with it. I’ll then repeat a few of those over the course of a month since it’s likely that all my followers aren’t seeing all my tweets. For Pinterest, I always have at least 2 or 3 different Pinterest optimized images to use, so I’ll just create a Pin for each one using the [Summary]. I then try to post them to 4 different, relevant boards (making a total of 8-12 different pins). For LinkedIn, I basically use the same posts as I use for Twitter, but without the image upload. All LinkedIn posts are just link post format for me. I only promote once on Instagram and I use the custom tweet. I may add a few extra hashtags, but that’s about it. For Tumblr, I pretty much just treat it like Google+ (minus the text formatting). There’s great SEO value in Tumblr, however, I can’t say whether or not I’ve reaped the benefits of it just yet. Since it’s no extra work for me, I add it in anyways. If you’ve been following my blog for a while, you probably know how crucially important visuals are in any digital marketing strategy. So, in addition to the Text Helpers, I also have a number of Image Helpers that I use as well. At minimum, you just need to have a Feature image and a Pinterest image and that will get you plenty far with your social shares. [Feature img] = the image that is shown on the blog post itself. [Title img] = a version of the feature image with the title on it. [Quote img] = a visual version of the quote Text Helper. [Pinterest img] = the primary Pinterest optimized image for the post. [Pinterest alt] = an alternate Pinterest optimized image. [Utility img] = usually a visual from the article that had utilitarian value or a square image version of one of the previously mentioned Image Helpers. All that in less than 5min?! Yes. The reason this only takes me 5min is because I use CoSchedule and they have an amazing feature called Social Templates. I was recently featured on their blog talking about exactly how I use it. Basically, I have created a sharing schedule with my Text and Image Helpers one time and can instantly apply it to any blog post I want using CoSchedule. All I have to do is apply the template, fill in the helpers, and when the blog post is published the social media promotion happens exactly as I’ve set it up beforehand. Now, if you don’t use CoSchedule but still want a way to create an optimized template for your social sharing promotion, our team at Warfare Plugins has created a new free tool called Soopz. Soopz was basically created to allow you to have a simple place to create optimized social media messages and save them for later. Here’s a video of me walking you through how to use it with the template I’ve outlined above. My Insiders have had access to this free tool for a few weeks now and the feedback has been great. Let me know if you have any feedback on the tool itself. It’s only in the early beta stages and we’ve got some grand plans for the evolution of it. Once you’ve crafted all your messages, you can then begin the copy/paste process of scheduling them out. Now, here’s where you can really perform some magic if you want to streamline this as much as possible. If you have a template such as mine in a text editor, all you need to do is run a Find and Replace for each of the helpers. 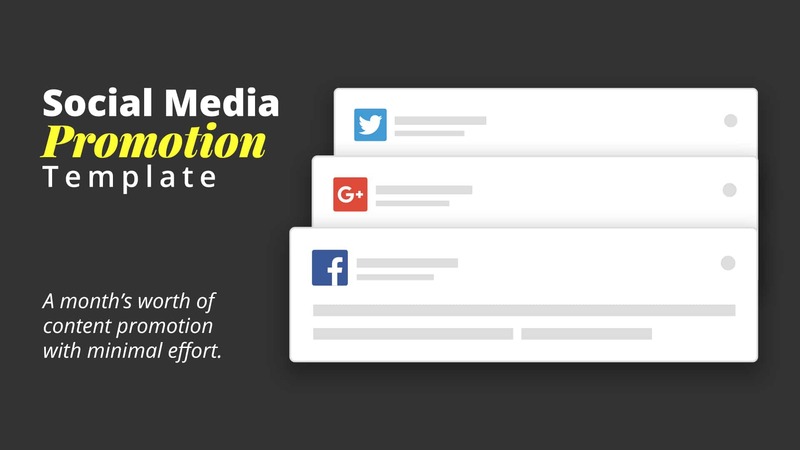 Using my example post from above I would start with finding [Title] and replace it with The Biggest Social Media Mistake (And How to Avoid It). Make sense? Then just do this same Find and Replace for all of your helpers. If you’ve downloaded my free template from above, I’ve recorded a quick video to show you exactly how I would use this template in real time. Being able to instantly schedule out 30 days worth of promotion for my blog posts in five minutes or less has been a total game-changer for my productivity. It’s almost impossible to count how many hours I’ve saved by using this one feature alone. The less time I have to spend writing and scheduling social media posts, the more time I can spend engaging with my community. This is why I highly recommend any serious blogger give CoSchedule a try. Otherwise, just go out and crush your content promotion with my template and customize it over time to meet your own needs! I’d love to hear how you end up using it. P.S. 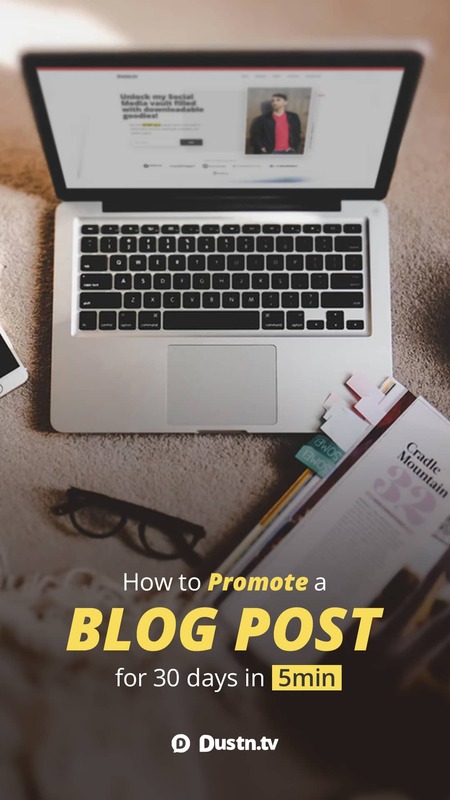 If you’re looking for a more exhaustive checklist on blog post promotion, my friend Mike Allton has written an excellent piece (complete with a checklist) which he calls Blog Promotology and it’s the most comprehensive guide I’ve seen. Hmm, not sure why you had that experience here, Michael… thousands of other people have been able to download with no problem. Wow, what a useful article. I knew I wasn’t getting enough out of my blog posts and this article has completely demystfied how I address that. Thanks Dustin. Awesome! Great to hear Sue! I like a pre-set template to work from. Adds order to your mind. I saw your recent post on Co-schedule; love the tool. I use it for a blog where I create a few guest posts each month. Much functionality and a fab spot for getting your team together to be on the same page. Great ideas, but just fyi – your template isn’t a template. It’s fully filled in with text (like in the video). I’ve had to go through again and change the copy/pasted info back to [Title] etc for each headline…. Doh! Thanks Dr. A! I’ve fixed the file–appreciate the heads-up! Dustin, I am officially your fan. I have read numerous pieces on promoting blog posts but your post is the Best. 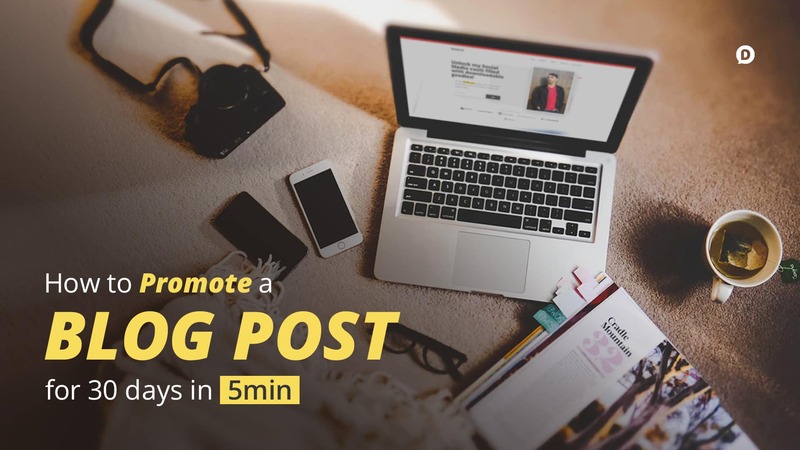 You have shared an organized and effective way of promoting blog posts which require little effort and will be saving tons of my time. Thank you! I’m literally going to use this all right now! I’ve used social media marketing for a long time now. I’ve never came upon a “template” to customize messages before that was built for optimum conversion/clicks/views/etc. Glad you found it useful! Come back after you give it a try and let me know how it worked out for you.